By Xah Lee. Date: 2014-10-27 . Last updated: 2016-03-02 . You need to install Java first. Unpack it, by tar xvfz filename. 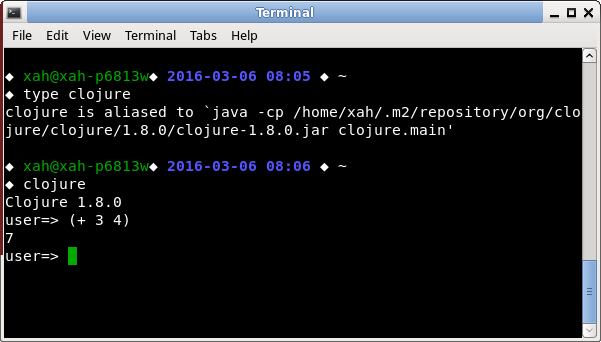 For example, after unpacking, i have this file clojure-1.8.0.jar. alias clojure="java -cp /home/xah/.m2/repository/org/clojure/clojure/1.8.0/clojure-1.8.0.jar clojure.main"
Now you can start Clojure REPL by just typing “clojure”.